Longtime CCU professor and administrator, Eddie Dyer joined the political science faculty in 1976 and held many key administrative positions; executive vice president, vice president of university relations, executive director of the Coastal Educational Foundation, interim director of athletics and interim dean of the Edwards College of Humanities and Fine Arts. 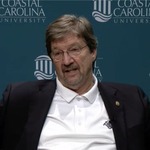 Dyer recalls his decision to accept his initial Coastal position, his beginning teaching years and his many roles on campus and in the community. He discusses the campus climate and the many changes he observed over his 40+ years' tenure at the institution. Dyer, Edgar L. III and Tomczyk, Charmaine B., "Edgar L. Dyer, III, oral history interview" (2018). The Coastal Carolina University Oral History Project. 2.